We’d love your help. 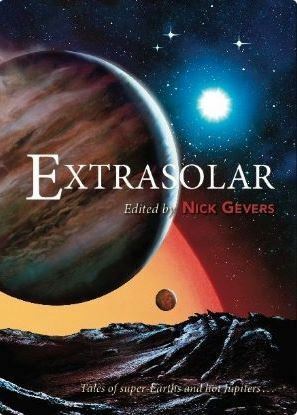 Let us know what’s wrong with this preview of Extrasolar by Nick Gevers. Among the brilliant visionary scenarios in Extrasolar: military antagonists meet in the atmosphere of a gas giant; gifted children hijack a starship to search out a new home; a superjovian world yields mysterious and much-coveted gemstones; aliens find our solar system disconcertingly paradoxical; a feminist SF writer of the Seventies crafts liberating exoplanetary dreams; Among the brilliant visionary scenarios in Extrasolar: military antagonists meet in the atmosphere of a gas giant; gifted children hijack a starship to search out a new home; a superjovian world yields mysterious and much-coveted gemstones; aliens find our solar system disconcertingly paradoxical; a feminist SF writer of the Seventies crafts liberating exoplanetary dreams; the habitats aboard a gargantuan spaceship cater to the needs of truly exotic aliens; and scientists eagerly seeking exoplanets confront a devastating truth. And then there are songs of home and far away and bitter exile; intelligence calling to intelligence across light years and species barriers; utterly immersive dives into perilous planetary atmospheres; brave responses to enigmatic messages from the stars; a machine embracing a Gothic destiny; and a truly different kind of space opera. To ask other readers questions about Extrasolar, please sign up. will this book hit Kindle any time soon?? This was a disappointing collection. I have read the introduction again after finishing the book to see if I have misunderstood the theme. Nope, it's about other solar systems and I was hoping for adventure, exotic aliens and some hard SF. Instead I got a mixed bag that left me unsatisfied and looked more like promotion for the included PS Publishing authors. Personal taste matters a lot when it comes to short stories so take my opinion with a grain of salt. A=very good, B=okay, C=didn't like it This was a disappointing collection. I have read the introduction again after finishing the book to see if I have misunderstood the theme. Nope, it's about other solar systems and I was hoping for adventure, exotic aliens and some hard SF. Instead I got a mixed bag that left me unsatisfied and looked more like promotion for the included PS Publishing authors. Holdfast – Alastair Reynolds (A): starts a bit like Enemy Mine but I loved the planet and the message of the story. Well done! Shadows of Eternity – Gregory Benford (B): good idea but didn't like the main character and found the dense prosa that was use to describe the planets hard to read. First hint that the theme of the collection is not what I had expected. A Game of Three Generals – Aliette de Bodard (B): a stream-of-consciousness story with a prisoner and an AI where the real punch is missing. Come Home – Terry Dowling (not finished): tried, failed, moved on. The Residue of Fire – Robert Reed (A): I don't know the other stories Reed has written with Ash but this was mindbending with a very interesting alien. Thunderstone – Matthew Hughes (B): does this count as SF? Felt like Fantasy with a touch of Lovecraft. Well written but I wondered if it belonged here and the different expectation lowered my enjoyment. Canoe -Nancy Kress (B): a cool exploration story with Polynesian influence that I really loved. Unfortunately weakened by the poor drama between the characters. The Planet Woman By M.V. Crawford – Lavie Tidhar (B-): again I wondered how this fits into the theme. The last part is the best but leaves too much to the reader. There isn't much meat here, only the raw idea. Arcturean Nocturne – Jack McDevitt (B-): strong character focus with only minimal SF. Predictable with a soap opera ending that totally annoyed me. Life Signs – Paul McAuley (C): at this point I was already in a bad mood so maybe the story is better than I think of it. Left me unimpressed. The Fall of the House of Kepler – Ian R. MacLeod (B): interesting idea, too bad that it restricts itself too much so I am afraid it won't leave a lasting impression. The Tale of the Alcubierre Horse – Kathleen Ann Goonan (not finished): I thought the golden rule of collections is to put the best story at the end (and the 2nd best first). I found the writing uneven with too much infodumping and characters I didn't like. Stopped after 10 pages or so. I've read enough of these PS collections to expect and be prepared for a very uneven collection. Typically (and in this case) there are a few well written stories by good authors, then there is a wide stylistic range of more mediocre writing. I was most disappointed that many of the stories had very little adhesion to the theme, which I thought was very cool.